Basketball is a fast-paced game that requires the knowledge and instinct to perform quickly and properly. The sport of basketball requires five basic skills. While some players might be more experienced with some skills than others, it is best to have at least some ability in all five areas. Dribbling is an important skill for all basketball players. This skill will allow you to move up and down the court, maneuver past defenders and execute plays. Proper dribbling requires ball-handling skills and knowledge of how to spread your fingers for ball control. It is also best if you know how to dribble equally well with both hands. 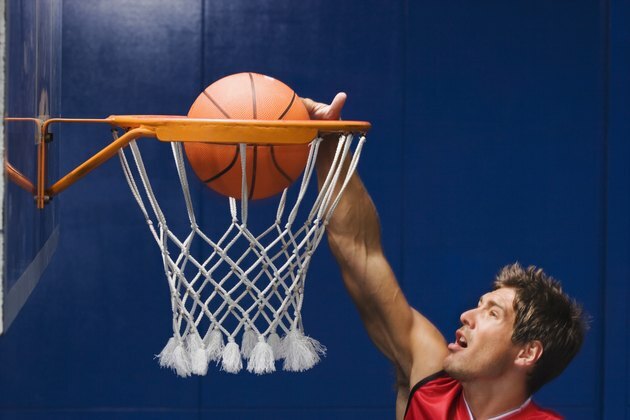 In order to score points in basketball, you need to shoot the ball into the hoop. This requires the ability to properly hold and throw the ball into the air toward the basket while avoiding defenders. A proper shot requires precise aiming, arm extension and lift from the legs. There are different types of shots you need to learn, including jump shots, layups and free throws. Running is a big part of basketball. In a full-court game, you will find yourself running back and forth as the game quickly transitions between offense and defense. When you have the ball, running will help you to avoid defenders and get to the basket quicker. On defense, you often will find yourself needing to run after the opponent, especially during fast breaks. Passing is another skill that when mastered can help you become a complete basketball player. Basketball is a team sport that involves finding a teammate who is open for a shot. The ability to pass the ball to this player can make the difference between scoring and not scoring. Really great passers are an important part of a basketball team and usually the ones who set up scoring plays. Jumping is another skill that can define how good a basketball player is. Jumping is involved in offense during the jump ball in the beginning, while taking shots and sometimes while trying to catch a pass. On defensive you will need the ability to jump when trying to block a shot or a pass. Being able to out jump your opponent for a rebound also is important.